The Seaton Expedition Seventy offers spectacular accommodations in an expedition-style world cruiser. If long-range voyaging in luxury is on your list of things to do, the Expedition Seventy is your boat. With her molded beam of over 22’, the Expedition Seventy offers extraordinary interior volume. The main saloon, dining area, and galley are contained in a space that is 16’ wide and 28’ long, giving home-like luxury—including a separate dining table seating eight—that is unheard of in a 70’ boat. Aft of the wheelhouse, the crowning glory of the Expedition Seventy is her Sky Lounge. Tall, tempered-glass windows offer uninterrupted views of the world outside. A built-in wet bar, refrigerator, and day head make this extraordinary space the ultimate private retreat. For complete versatility, the built-in settee extends to form a double berth for occasional extra guests. A cozy observation deck aft of the Sky Lounge offers additional seating and outdoor dining space. United Yacht Sales New Jersey would love to guide you through a personal showing of this 70' Seaton Expedition Seventy 2018. 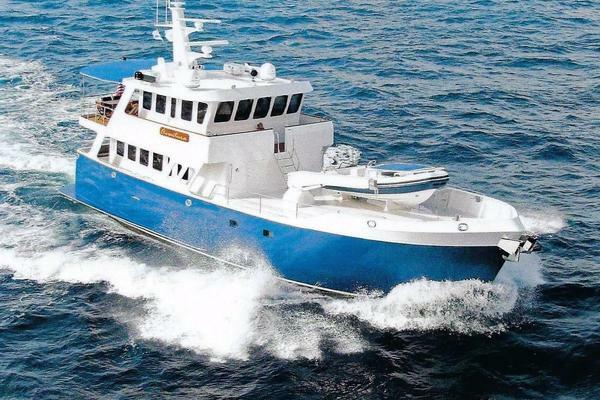 This yacht for sale is located in Newport, Rhode Island. For pricing details or a showing please contact us by filling out the form on this page and we will get back to you shortly!